Let's check out some examples! I'll underline the subordinate clauses for you. Nathan ate pancakes while he read the newspaper. Whenever he sees a pretty sunset, Nathan wants to visit the beach. Sentences can start with either the independent clause or the subordinate clause. Notice that if the subordinate clause comes first, you must add a comma. If the independent clause is first, you don't need a comma. Independent clauses are groups of words that contain a subject and a verb, and they can stand alone as complete thoughts. Independent clauses act all by themselves and don't need any help. They can stand alone, and in the case of complex sentences, they are nice enough to help out those cute little subordinate clauses! How kind of them! A subordinate clause (aka dependent clause) is also a group of words that contains a subject, but this kind of clause cannot stand alone as a complete thought. These guys need to be linked to independent clauses in order to make sense. Here are those two subordinate clauses joined with independent clauses. Now they make two complex sentences. Because I was hungry, I ate seventeen pancakes. I get stomachaches whenever I overeat. Subordinate clauses come together to function as one part of speech. They can act as adjectives, adverbs, or nouns, and each one is joined to the independent clause with a different kind of word. All of these example sentences are complex because they contain an independent clause and a dependent clause. 1. 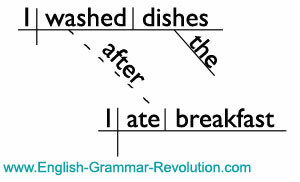 Dependent adjective clauses act as adjectives. That means that they modify nouns or pronouns. They're joined to independent clauses with words called relative pronouns or relative adverbs. 2. Dependent adverb clauses act as adverbs. That means that they modify verbs, adjectives, or other adverbs. They are joined to independent clauses with subordinating conjunctions. I washed the dishes after I ate breakfast. 3. Dependent noun clauses act as nouns. They can do any of the noun jobs (subject, direct object, object of a preposition...). They are introduced by wh- words or words that you can call noun clause markers. Understand the complex sentence? Learn about other sentence structures.